Poster art has been around for years. When it really started to flourish in the 60’s with the psychedelic movement, artists and venues created posters that defined a musical era, marrying music with art for bands like Led Zeppelin and Jimi Hendrix playing at the Fillmore or the Palladium… the golden age of “rock art”. Then it seemed to all but die out during the 80’s. Until (it seems) about the time that CD’s began replacing vinyl, and the album artwork became smaller. I believe it was about this time that the ‘poster artist’ was reborn… or better yet, re-awakened. More sarcastic and straight-forward then their subtle predecessors, artists like Kozik, Coop and Derek Hess, drawing from what shaped their views of the world, started putting out vivid images, mocking late 60’s-early 70’s pop culture to promote their favorite bands. This handful of pioneers created quite an underground scene that re-paved the way for a slew of new and talented artists. Now the poster art ‘movement’ if you will, is back in full swing – and not just limited to independent bands – or even music for that matter. I’m sure you’ve all seen the “Coop Devils” or “Kozik Chicks” on stickers, shirts… hell, even Altoids ads, all born from small time artists, doing what they love for the music they love. I’ve followed poster art for quite some time, collecting my favorite artists and getting turned on to new ones. Of the new artists, a few rise to the top, the “crème de le crème” if you will. At the top of the list is poster artist Jermaine Rogers. One of the more desirable artists working in his field today, Jermaine has helped set the curve in which all other poster artists are graded. Drawing more from the weird and ironic late 70’s and early 80’s, Jermaine warps and mutates images and icons that we’re all familiar with, showing us all what the “True Hollywood Stories” for Sesame Street or Happy Days might be like – or what it might look like if Han Solo told Luke who was really the coolest. Jermaine allowed us here at RANT the opportunity to ask him a few questions about what he’s trying to create with his art, where he’s going next and why it’s important that the audience ‘gets it’. RANT: I can’t help but notice your 70’s and 80’s pop culture influence and parody, which is what I find, draws others and me to your work the most. It seems that music fans of the genres you create art for, relate to the same influences you draw from. Is that what you are striving for? What other influences do you draw from when conceptualizing your work? Jermaine: In many ways, I’m striving to do posters that people who are NOT artists would do if they were artists. Know what I’m saying? It’s like; when I was a kid there were certain things I always wanted to see. Like on cartoons, I always wanted to see that cat Tom finally catch Jerry and like… eat him or something. Or, I always wanted to see a scene in Star Wars where Han Solo and Boba Fett just throw down. You know what I’m saying? But, NO ONE ever gave any of my friends or me what we WANTED to see… mostly because the confines of the ‘story’ or ‘franchise’ prohibit it. Conversely, the ‘concert poster’ as a vehicle for artistic expression is SO wide open. You can do ANYTHING… and almost EVERYTHING gets done. I attempt to try and put myself in the position of the average ‘Joe’ on the streets. Someone with little or no artistic ability, what do they think would be ‘cool’ to see promoting their favorite bands? A lot of the content is born through this process. And it’s not really as ‘calculated’ or ‘planned’ as it might seem. It just happens. I do what I want, and as I’ve said before, I’m fortunate that other people ‘get it’. There are some ideas that have been in my head for years and just haven’t been put on paper yet. Sooner or later they will… I guess. The SUPERCHUNK poster a while back was like that… the one with the scene of PACMAN being gang-attacked by the ‘ghosts’. I’ve had that scene in my head since I was like 10 years old. Literally, when I played PACMAN, every time PACMAN got ‘caught’ I wondered, ‘what exactly did the ghosts DO to PACMAN?’ It’s weird, but little things like that stay with you, and all that you need is an opportunity to let that stuff out. Poster art is my outlet. Jermaine: KITT not needing Michael? Get serious. But yeah, those are good examples. Right now, the ‘stage’ of poster-art offers an artist the opportunity to play with such ‘copyright-protected’ subjects and get away with it… most of the time. In addition to all of that, I just keep my eyes open. The NEWS is important. I watch and read lots of it. To me, the secret is elevating the viewers of your artwork to a level of control over the art. You’ve got to put your artwork in a context where the viewer can ‘own’ it, mentally and emotionally. The average person wants to feel like they ‘get it’, you know? I think that’s where some artists make a big mistake in this field. They try to out-think their audience. Why would you do that? It’s suicide, professionally speaking. No one cares about how smart you are. I prefer to sort of lead them along by a familiar thread to the ‘idea’ I’m trying to get across. Give them some familiar ground to tread… so the poster feels ‘close’. They ‘get it’. Social commentary always does that. Like, you could do a poster where you explore all of the ins and outs of Kirshner’s ‘alternative reality’ and ‘connected event’ theories and try to force your audience to wrap their brains around THAT, OR you could do a poster image asking, ‘What if Kurt Cobain had never married, and therefore, Kurt never died prematurely? Where would he end up?’ Like, you’ve covered the exact same themes… but you’ve given your audience the power to ‘own’ your poster through familiar content: Kurt. They ‘get it’. 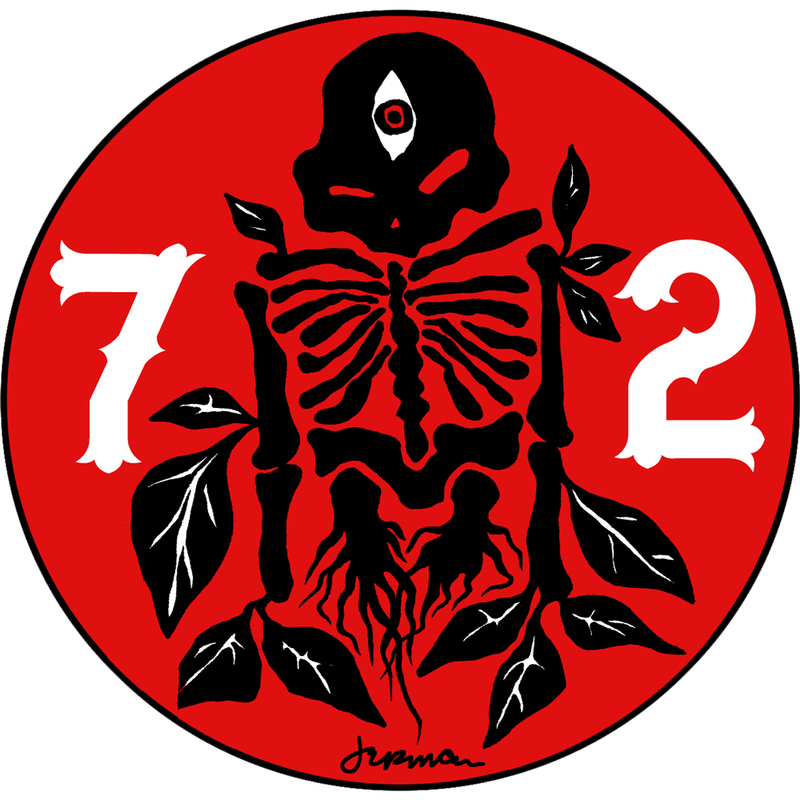 RANT: Is there significance in the re-occurring numeral 72, the Bears or the Aliens? Jermaine: Yes, yes and yes. Keep up with the DERO storyline that pops up from time to time in my posters, and you’ll see. ’72’ is a tragic number, the ‘Bears’ are NOT ‘bears’ and there are no aliens. RANT: The DERO storyline? What is that? I’ve seen the ’72’ and have my own conceptions of what it might signify, but it’s best to let each come to their own conclusions, right? Does DERO stand for something? And should we watch for more installments in the DERO storyline? Jermaine: The story of the DERO is a tragic one. I don’t want to reveal too much, but basically, the ‘bears’ are not what they seem to be. There are malevolent and benevolent bears, as many people have now noticed. The malevolent ‘bears’ are actually ‘breeders’… but more than that. They are ancient. They have affected much of human history. They have caused wars. They have prevented wars. And a few times, the veil has been lifted, and some of the ‘surface folk’ have become aware of their existence. They’ve bred a race of beings much like themselves, but with a unique difference, that I wont go into here. These bred beings have appeared as the pink, ‘friendly-looking’ bears. There are things going on in their communities down below… beneath the surface of the earth… and when the entire thing is revealed, then the answer to what the bears ‘are’ will be evident.And there are NO aliens. There will be more installments. At first, I wanted to rush it… but I’m taking my time. They’ll be popping up in the regular rotation of my poster jobs. RANT: What kind of training do you have in your craft? Jermaine: I’m fairly self-taught… and there are some who would say that that’s obvious. I learned most of what I know by looking and copying and a whole lot of trial and error. In some ways, I realize that I am very rough around the ‘technical’ edges. There are many things that I don’t do by the ‘book’. It’s funny, but there’s a fellow artist in the western USA who told me that my fundamentals were flawed: from line-art style to layout skills. Then, I showed them my early work, most of which is not up on my website (I’m lazy) and they were shocked. I did most of the work from 97-99 with a brush. I adhered closely to the ‘rules’. Nowadays, I just don’t care. I certainly am still learning constantly. I talk with EMEK, and I learn something about better linework. I examine Hampton’s originals, and I learn about better layout. Frank Kozik recently gave me a chastising over the phone about ‘color’. I study Kleinsmith, FACTOR 27, and Aesthetic Apparatus and learn more about ‘design’ and the finer points of ‘text’ usage. The cool part is that you never stop learning, and you’re never expected to. To me, the final test is whether it works in the minds of the people. If I do everything ‘wrong’, and there’s an overwhelming positive reaction from the public and the client, why should I change… unless I personally wanted to? Who determines what’s ‘wrong’? RANT: You say you talk with EMEK and Kozik, are you close with the other poster artist out there? Which artists that are out there right now do you think are putting out good work, or maybe there are some artist that are out there that we haven’t seen yet that you know about. Anyone you think we should be on the lookout for in the future? Jermaine: Yea, I’m pretty tight with a few people out there. Justin Hampton and EMEK are pretty close friends. We recently did a major show (‘Post Neo Explosionism’) in Seattle and it was a huge success. POST NEO EXPLOSIONISM 2 will be held this coming year in a very cool city, but it’s still in planning. I’m also good friends with Frank Kozik. In the loosest sense of the word, he’s been sort of a mentor to me. I’ve spent hours in ‘one-on-ones’ with him. A lot of real knowledge about this business: he’s ‘done it’. He also ‘gets it’. I mean that, it’s not about this being some ‘career’… it’s about doing what you love. ‘Getting paid’ is like a bonus. I’m also really tight with Jeff Wood and Judy over at Drowning Creek. Same deal: they ‘get it’. Rob Schwager, also known by the name ‘Trucker’, under which he designed a slew of good posters. Really, there are several people that I’ve become friends with. Brian Ewing, Mike Fisher, Mike Murphy, the Factor 27 guys, Kleinsmith… I could go on. There are lots of really good guys doing this work. I think right now, there are so many different looks and styles, so there are so many people to watch. The California guys who’ve started in the last couple of years are all talented. Ewing, Fisher, and Murphy are all honing their style. They’ll get there, and fast. The Factor 27 guys, along with Aesthetic Apparatus and Methane Studios are really doing revolutionary things. They’ve sort of come full circle, I think… and it will be interesting to see if they can now step into something completely new. That’s what will equate into longevity, obviously. And there are tons of other folks. Tyler Stout, Leia Bell, the amazing Print Mafia… and guys like Mike King and Kleinsmith who just continue to evolve that ‘northwestern’ look. Then, you’ve got www.Gigposters.com, which is like a ‘base station’ for this entire movement right now. There’s never been another time in this field where massive interaction was so easy. It’s an exciting time. RANT: What artist have influenced you that say, don’t do poster art, but work in other mediums? Jermaine: Most folks know my usual list. Vincent Van Gogh, Gustav Dore, Graham Ingels, and Harrison Fisher lead the list. Many comic book artists from the golden age of comics (late 40s-50s) influence me. Obvious direct influences like Frank Kozik and also the 60’s guys (Griffin, Mouse, Wilson, etc.). There are so many. I’m forgetting a lot. That guy who did Subhumans covers in the 80s. Mark Dancy. Arthur Triedler. More. Also, Wieslaw Walkuski. He’s an amazing polish poster artist and usually does work for high-end stage productions and film. He is, in my opinion, the best poster artist working today. Period. RANT: Do you create art for anybody who approaches you? Or do you limit your work to bands and venues that you enjoy yourself? Jermaine: Obviously, we all need the occasional dollars to keep mind and body in harmony. Thankfully, I’ve been fortunate enough to not HAVE to do anything I don’t want to. I’ve turned stuff down before. Stuff I don’t respect or that I just find boring. And, unfortunately, I turn down some really sweet stuff that I just don’t have the time to do. RANT: Do you take on projects other than poster art, like album covers or fine art? Jermaine: Yes. I’ve done several covers. T-shirts. Magazine covers and artwork. And yes, I paint. I’ve sold more than a few pieces in the last year or so. My latest significant sale was in Amsterdam last month. Before that, there was a sale of an acrylic piece called ‘Tolstoi’s Pain’. It was a painting of Tolstoi seated in a chair sobbing while looking through a telescope at death. I reread his diaries recently, and he always seemed to ‘see’ death coming… like, right on the horizon. I’m slowly making the shift to painting the majority of the concert posters I do. Recently, I used painted imagery for both BRAD and COLDPLAY posters. They were paintings that were done very quickly, in a Wulverton sort of method: very fast, muddied stokes, corresponding color tones. Some folks loved them. Some folks hated them. RANT: Being familiar with your work, I know that you work with a broad range of artists from indie acts like Zeke all the way to your arena rock acts like Radiohead and Weezer. Do these bands come to you and ask you if you’d like to work with them, or do you approach the bands you yourself would like to work with? Jermaine: It happens a variety of ways. Sometimes bands approach me. More often, it’s by promoters or labels. Then there are times when I see something I want and make a few calls to get it. RANT: Do clients come to you with pre-conceived ideas about what they’d like to have you do for them, like themes and colors? Or, does the client usually leave it up to you? RANT: What are you working on right now that we need to watch out for? Jermaine: More paintings. More DERO. More posters. SCREENPRINTS of my paintings. That one’s coming soon. Toys. Yes, teddy bears, Jigris, and MERB’s (these are new characters yet to come). You know, just whatever I feel like doing. That’s the cool part. Half of the time, ‘I’ don’t even know. I’ve been accused of ‘shameless self-promotion’: so there will be more of that. I’m pathetic. RANT: Are there any acts or venues you haven’t worked with but would like to? Jermaine: Johnny Marr and Morrissey need to reunite and do something so I can do the poster. Wouldn’t a big SMITHS poster be sweet? I’d really like to do something for Richard James (APHEX TWIN). I would love a Bowie poster. I also would like to do a poster for Pete Seeger or Leonard Cohen, two legends. I never got to do anything for The Subhumans a few years ago when they toured again, and I hate that. Check out Jermaine’s site at www.jermainerogers.com, you’re bound to see something you like or that jars a memory of your past. Make sure you check out the “links” page on Jermaine’s site… it might open doors to a vast world of art you didn’t even know existed (or maybe you did). Thanks again for everything Jermaine!